You’ve worked hard for 40-odd years and now you are ready to ready to enjoy a long relaxing retirement. But where should you live? You probably want to be somewhere affordable to get the most out of your retirement savings, but you may also want to be somewhere with warm weather and relaxing activities. It may also be important that you retire to a place where the stress of potential crime is far from your mind. Below, we used these and other metrics to determine the best places for a relaxing retirement. Planning to retire soon? Try SmartAsset’s retirement calculator to see how much you should be saving. In order to determine the best places for a relaxing retirement, we gathered data on nine factors. Specifically, we looked at average effective tax rate, healthcare costs, the percentage of population ages 65 and over, the crime rate per 100,000 residents, the number of warm days, the number of personal care service establishments per 100,000 residents, the number of medical care establishments per 10,000 residents, the number of museums and historical sites per 100,000 residents and, finally, median housing costs. To see where we got the data and how we put it together, check out our data and methodology section below. Two states dominate – Our data suggests that if you want a relaxing retirement, there are a couple states you can’t ignore. 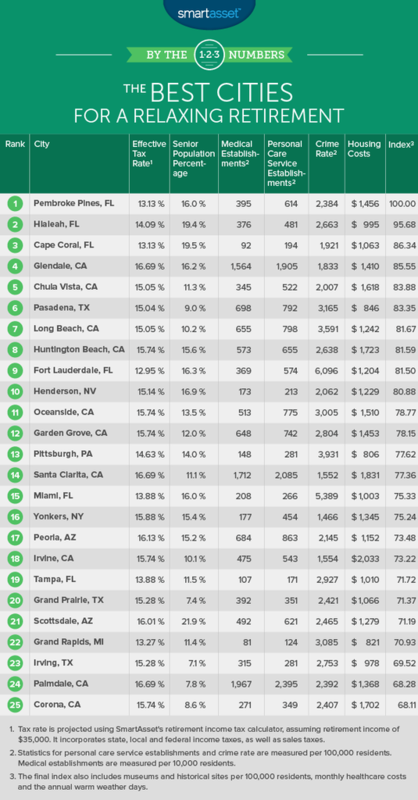 California and Florida absolutely dominated our ranking, claiming nine of the top 10 cities. Beach time – Quite a few of the cities on our top 10 are located very close to beaches. Mid-sized cities – The average population for our top 10 cities is about 228,000. Some of the cities have done a great job of attracting potential retirees and offer plenty of relaxing options for retirement. This city, located in the southeast corner of Florida, claims the top spot in our study of best cities for a relaxing retirement. Pembroke Pines has the 10th-highest percent of population ages 65 and older. It offers retirees the chance to make plenty of friends in year-round warm temperatures. Plus, the tax rates are low. Retirees can expect to pay an average effective tax rate of about 13%. That’s the 16th-lowest rate in our study. Pembroke Pines also has 172 personal care services in the area which are dedicated to relaxation, including day spas, saunas and steam baths. Using a 401(k) to save for retirement? Use our 401(k) calculator to see how much you should be putting away. Hialeah, also located in southeast Florida, offers many of the same benefits as Pembroke Pines, namely warm weather and company. Hialeah has more retirees than Pembroke Pines. Data from the U.S. Census Bureau indicates that almost one in every five people here are over the age of 64. Hialeah also has plenty of access to medical care. There are almost 376 medical establishments per 10,000 residents – a top 20 rate. Cape Coral is one of the most popular destinations for retirees, and for good reason. For one, retirees won’t have to worry much about crime. Cape Coral has the 11th-lowest crime rate in the country. It also has the second-highest percentage of population over 65. Plus, Cape Coral has 321 establishments in the area dedicated to personal care. The healthcare costs here can be on the high side though. Data shows that monthly healthcare costs can exceed $1,050. Learn more about Florida retirement taxes. Glendale is one of the more expensive cities on our list, with monthly housing costs exceeding $1,400 and an effective tax rate of 16%. Glendale ranks at the bottom in both those factors. But if you’re able to pony up the cash, it may be worth it. Glendale has the fifth-most personal care establishments per resident and the fifth-most medical care establishments per resident. You won’t have to worry about crime here either. It has the ninth-lowest crime rate in the country. The City of Allure is may be a good place for retirees looking to relax. It is one of the best cities for relaxing activities. It has top 25 scores in museums and historical sites per 100,000 residents and personal care establishments per 100,000 residents. So if you’re into massages and museums, Chula Vista may be the place to retire. It also has a top 25 score in medical care establishments per resident. There are 345 medical care establishments per 10,000 residents. The sole Texas representative in our top 10 is Pasadena. It is one of the smallest cities in our top 10 with a population of 153,000, according to U.S. Census Bureau data. Retirees looking for a quiet place may find themselves more comfortable here. Pasadena has great scores in many of our metrics as well. It has 791 personal care establishments per 100,000 residents, as well as 698 medical care establishments per 10,000 residents. Both of those are top 10 scores. 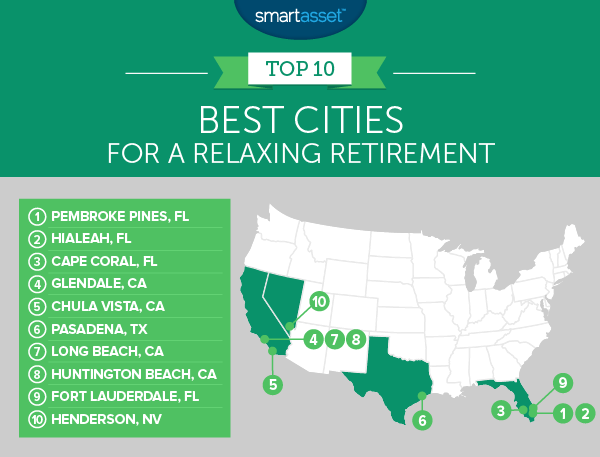 Long Beach finishes seventh for best places for a relaxing retirement. Like other California cities, Long Beach is on the expensive side. Median monthly housing costs around $1,200 on average and the average effective tax rate is about 15%. But you will catch a break on healthcare costs. Data shows average monthly healthcare costs to be about $548 in Long Beach. That’s the 21st-lowest in the country. Like many other California cities, you’ll have easy access to healthcare and personal care establishments. Long Beach ranks in the top 10 for both of those metrics. Surf City, as it’s known, is a great beach town with plenty of relaxing opportunities for retirees. Obviously sun bathing on the beach is one option here, but if you are looking to be pampered, Huntington Beach also has 655 personal care establishments per residents. The final southeastern Florida city to appear in our top 10 is Fort Lauderdale. If you are retiring soon, consider visiting “the Venice of America” to check it out. In a previous study, we found that Fort Lauderdale was one of the most affordable vacation destinations. The city is warm and has a high percentage of retirees already living there. Its average effective tax rate is below 13% and monthly housing costs are about $1,200 on average. Henderson finishes off our top 10 of the best places for a relaxing retirement. This city, only 16 miles away from Las Vegas, is a retiree oasis in the middle of a desert. Almost 17% of the population in Henderson are over the age of 65. Henderson also has the 16th-lowest crime rate in the country, with just 2,061 crimes per 100,000 residents. The area comes equipped with 580 total personal care service establishments to wind down in. Average effective tax rate. We calculated the average effective tax rate using SmartAsset’s retirement tax calculator and assumed retirement income of $35,000. We took into account state and local sales taxes and incomes, as well as all applicable rules and deductions. Median monthly healthcare costs. We used the Kaiser Family Foundation health insurance calculator to estimate the cost of a silver healthcare plan for a 60-year old in each city. We did not incorporate any subsidies. Median monthly housing costs. Data comes from the U.S. Census Bureau’s 2015 5-Year American Community Survey. Percentage of population ages 65 and older. Data comes from the U.S. Census Bureau’s 2015 5-Year American Community Survey. Crime rate per 100,000 residents. The crime data comes from FBI’s 2015 Uniform Crime Reporting Program and from local police departments and city websites. Warm days. This is the average number of days per year in which the maximum temperature exceeds 50 degrees. Personal care service establishments per 100,000 residents. This metric includes a wide array of establishments dedicated to relaxation, including nail salons, day spas, massage parlors, saunas, hair salons and barbershops. Population data comes from the U.S. Census Bureau’s 2015 5-Year American Community Survey. Data on personal care establishment comes from the U.S. Census Bureau’s 2014 County Business Patterns Survey. Medical care establishments per 10,000 residents. This metric includes establishments like doctor’s offices and home health care services. Population data comes from the U.S. Census Bureau’s 2015 5-Year American Community Survey. Data on medical care establishments comes from the U.S. Census Bureau’s 2014 County Business Patterns Survey. Museums and historical sites per 100,000 residents. Population data comes from the U.S. Census Bureau’s 2015 5-Year American Community Survey. Data on museums and historical sites comes from the U.S. Census Bureau’s 2014 County Business Patterns Survey. We ranked all cities by each of these metrics, giving double weighting to the average effective tax rate, crime rate and personal care establishments per 100,000 residents. All other factors received a single weighting. We then averaged those rankings. After averaging, we applied a score based on the averages. The city with the best score received a score of 100 and the city with the worst score received a score of 0.